Property 4: Walk to Beach, Pool & Clubhouse. Huge Furnished Deck & Grill; Hot-Tub & Sauna! Property 7: The Lehigh Lodge - Featured in Philadelphia Magazine - Book Now for Summer! Property 8: Plan a Pocono Vacation! Low Rates & Linens incl. Close to All Area Attractions! Property 9: Cozy retreat on Jack Frost Mountain! Property 10: Check out the low low mid-week rates! Avoid the crowds at the lifts! Property 12: Lakefront--Hot Tub, Pool Table, Dock, Boats, WIFI-- !! Property 13: A Great Place to Relax & Unwind- Superb 3 Bedroom Home w/ Private Beach Access! 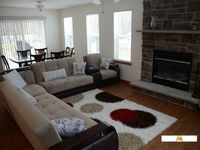 Property 14: Tastefully Decorated, Beautiful Chalet With Hot Tub, Pool Table, and Game Room!! Property 15: Rent the All NEW Pocono Mountain Oasis 2. NEW 7 Person Hot tub & Playground. Property 16: Come Enjoy Beautiful Pennsylvania and Stay at Our Cozy Home!!! Property 17: 2 Full Baths, Sleeps 8 in Locust Lake Village. Book for spring and summer! Property 18: Book now for Summer! Property 21: Outstanding lakefront property with views of spectacular sunrises. Property 26: Mountain Top Chalet with Fantastic Views, Location, Location, Location! Property 27: Blakeslee Forest Retreat w/ Fire Pit & Deck! Property 31: Take a Holiday - at the Holiday House! Property 33: True Log House-4BR+Loft/2BA , Game Rm, Close to Lake. Property 37: Your Home Away From Home! Property 38: Albrightsville Home w/Hot Tub, Deck & Game Room! Property 40: Superb Pocono Lake House w/ Private Beach & Dock! Property 46: Updated & Private Lake Harmony Home w/ Large Deck! Spend your Summer Vacation in the Mtns!! Pet friendly, spacious, hot tub!! Property 48: Spend your Summer Vacation in the Mtns!! Pet friendly, spacious, hot tub! !